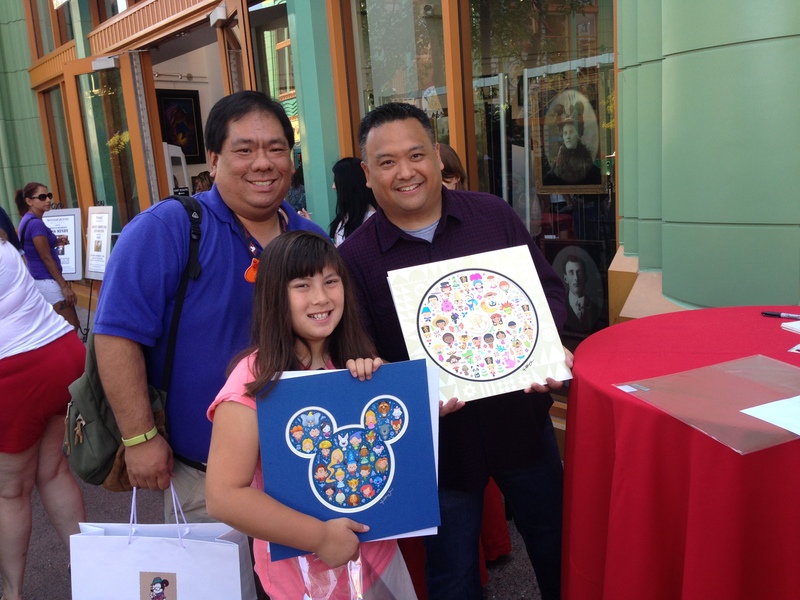 Fans on the West Coast have been privileged to enjoy the many artist signings that Jerrod Maruyama has done for the WonderGround Gallery in Downtown Disney, Anaheim. But next Friday and Saturday, Jerrod’s fans on the East Coast will have something to look forward to! He is one of four featured artists at the grand opening of the WonderGround Gallery at the Marketplace Co-Op in Downtown Disney from 1pm to 3:30pm on March 6th and 7th. As if that wasn’t enough, Jerrod will appear at the Epcot International Flower and Garden Festival on Sunday, March 8th to celebrate the release of his Mickey and Minnie piece in honor of the event. He’ll be at the Festival Center from 11am to noon and 1pm to 2pm. I was able to catch Jerrod before his trip to WDW and he graciously agreed to do another interview for Disney Nerds! Hi, Jerrod! Thanks for taking the time to do a follow-up with me. Since we interviewed you last, I actually got to meet you in person! Thanks by the way for the autographs. My daughter and I proudly have your pieces up in our living room. I imagine many people send you pictures of your artwork being displayed. Has there been anyone who put it up in a weird or interesting place? Has there been someone who’s used your piece in a really creative fashion? I’ve seen various photos of collections. While there hasn’t been anything weird that I can recall, I am often amazed at just how much of my work some people own. It’s always humbling to see and I am so appreciative of their support. Having your work up in someone’s house is truly an honor. I never want to take that for granted. It’s a privilege. Many people are now familiar with your Hipster Mickey line of art and in fact it seems to have gained a good following. Good enough that there are many products out with your Hipster Mickey artwork on it. What was it like to see the influence of Hipster Mickey transcend your art pieces and find it on all of this cool merchandise? Are we any closer to a Maruyama line of Vinylmation? It’s very gratifying to see my art on merchandise. The quality of the products is a testament to the great folks that I work with at WonderGround Gallery. They do a wonderful job translating my work into merchandise that is appropriate to the spirit of the image. I like that it gives customers an option when purchasing my artwork. No plans for a Vinylmation line just yet. Has Hipster Mickey’s popularity added new opportunities to your career or to your connection to the company? If so, in what ways? 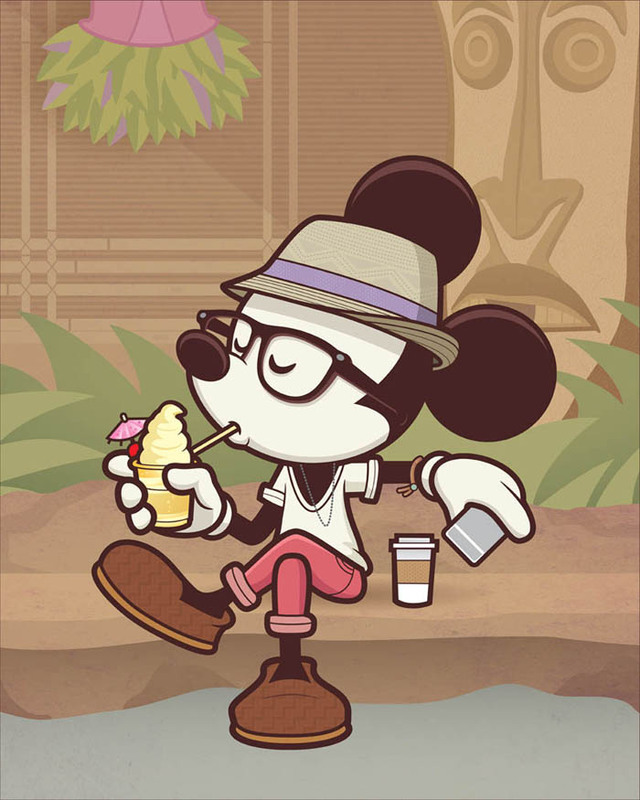 I think we all continue to be surprised by Hipster Mickey. This line has continued longer than I thought it would. I can’t really say how it’s added to my career but it’s certainly one of the most seen images I have created. For that, I’m sure I owe Hipster Mickey quite a bit. One of your new pieces over this past year was the “Date Night” piece featuring Mickey and Minnie. 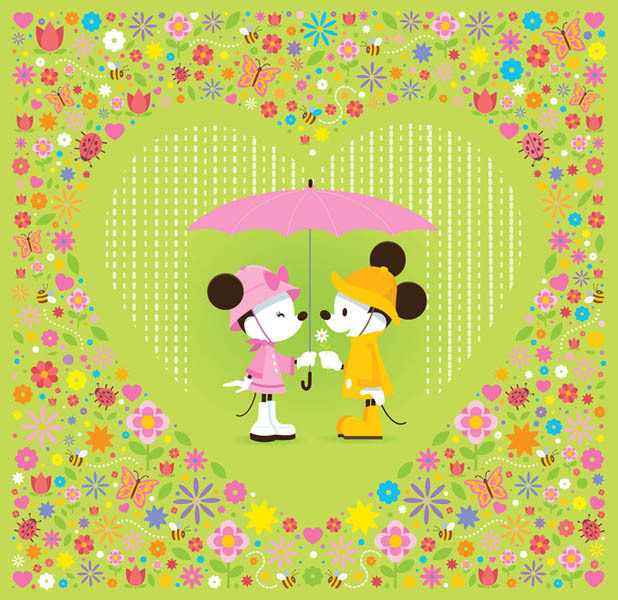 You’ve also done pieces like “Love in Bloom” and “Modern Mouse.” Do you have a particular name for this style of art like you do for Hipster Mickey or World of Cute? No, I don’t really have a name for those other approaches to Mickey. I always enjoy working with Mickey Mouse in my art. He’s iconic but still versatile enough to use in various situations. Sometimes a certain style just fits what you’re trying to say visually. It’s just another approach to drawing the mouse. I’m sure many of our readers and your fans are curious how these pieces are developed. When you design a piece is it already with a style in mind? Does Disney ask for certain types of commissioned pieces or do you propose them on your own? Only the Hipster Mickey line and the World of Cute line have a specific style that’s been established in earlier pieces. The rest of the work comes from my imagination. This is the best part of working with the gallery. They are always completely open to new ideas. I’ll send them a few proposals – sketches and such – and they decide what will work best for the gallery and the coming year of events. It’s a very organic process and a very satisfying way to work – especially with a big company like Disney. Has it sunk in yet that you are a well-known Disney artist? That your pieces are helping to shape how we see Disney characters and Disney art? How does that feel and how has it affected you? What is your favorite part about being a Disney artist? That’s a very generous question. I guess I don’t see it that way exactly. I’m always happy when people respond to one of my images for the gallery. To me, that’s what it’s all about. When someone sees the image and feels the need to buy that image – that’s a good feeling. The rest of it is extra. Meeting people at the signing events is so much fun. I love this stuff just as much as they do so it’s exciting to talk to them about all things Disney. I understand that you’ll be one of four featured artists at the opening of the expanded WonderGround Gallery presence in the Marketplace Co-op at Walt Disney World. Are you excited about the trip? Other than meeting your fans, what are you most looking forward to? Are there any “must do” attractions or restaurants for you at WDW? And if you could plan your next Disney theme park to visit with your art, which one would it be – Tokyo, Paris, Hong Kong, or Shanghai and why? I am so excited that WonderGround is coming to Disney World. I’m hoping it opens up a whole new world of opportunities for artists. I’m truly honored to be going there to help kick off the grand opening. I can’t wait to see the new gallery and the Marketplace Co-Op. When I was last in Florida in 2012, much of the new stuff wasn’t there yet. I’m excited to see what’s changed. The only thing I truly have to do while I am there is the Seven Dwarfs Mine Coaster. That wasn’t finished when I was there last. I am actually hoping to go to Tokyo Disneyland in the fall. This would be all for fun. No plans for a signing or anything like that. I’ve heard such great things about Tokyo Disneyland and Tokyo Disney Sea. I think I will need to bring an empty suitcase just for all the shopping. Other than that, I would love to go to the new Shanghai park when that opens. The stuff I’ve seen that’s planned for that park looks amazing. That was a lot of questions so I just want to thank you so much for agreeing to do this Jerrod. Your article is still one of the most popular on my site and so many people are fans of yours, I’m sure they’ll be interested in this update. Thank you again and much success to you in the future! Thanks for taking the time to talk about my work. Appreciate the opportunity. Read more about the WonderGround Gallery in Downtown Disney, Anaheim on the Disney Nerds blog. Previous Previous post: O…M…G…! Star Wars Rebels Pulls Off Best Season Finale Ever!